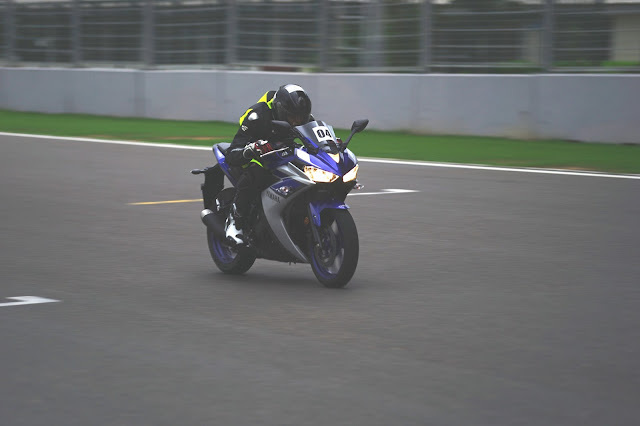 Home > yamaha india > The Yamaha R3 - First Impression. The Yamaha R3 - First Impression. Its barely been 2 days since the launch of the Yamaha R3 in India and the social feeds are flooded with comments, justifications, rants, likes and dislikes about the machine although there have been very few that have had the opportunity to ride the R3 and its competition back to back to provide a full overview of this latest offering from Yamaha and how it stacks up against the competition. 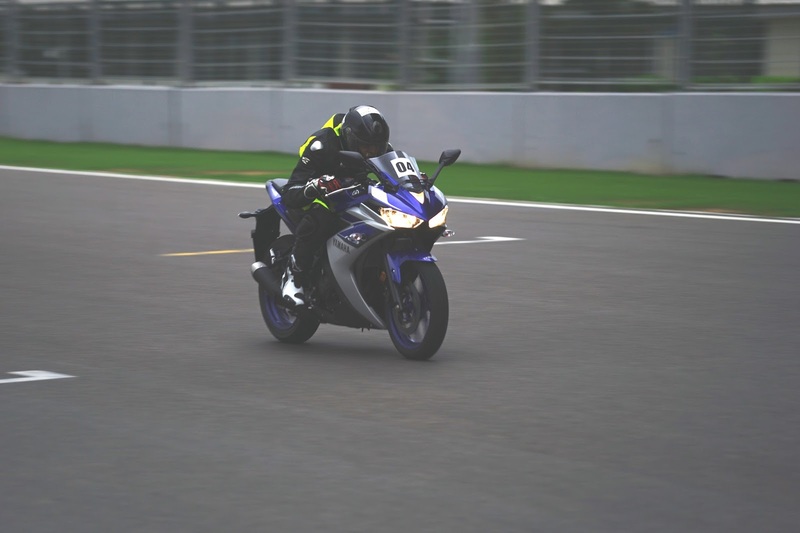 The ThrottleQuest team was invited by Yamaha to get a first glimpse of the R3 and the opportunity to test ride it around the magnificent Buddh International Circuit. Before we proceed let’s look at what Yamaha has put into the R3 costing RS. 3,25,000 ex showroom Delhi. Unlike singles provided by the Honda and the KTM, the R3 runs on 321cc twin cylinder, fuel injected, liquid cooled, 4 stroke, DOHC, 4-valves per cylinder engine pumping out ~42 bhp @10750 rpm with ~29 Nm of torque @9000 rpm. The engine carries a lightweight, all aluminium DiASil cylinder (die cast all aluminium cylinder) that offers adequate heat dissipation for consistent power delivery and reduced weight. I noticed that power was instant and smooth through the gears although I struggled to redline on 5th and more than often reached the end on the back straight before I could shift into sixth - top speed you ask? Wait for the video. Yamaha pointed out that the crank design offsets the cylinder 7mm relative to the crankshaft (to the exhaust side) to reduce frictional losses between the pistons and the cylinder wall during the power stroke for improved power output and improved fuel economy. Lightweight forged aluminium pistons provide fast engine response, reduced weight and reduced mechanical vibration. The 180 degree crankshaft has an uneven firing order. The 32 mm dual bore throttle body fuel injection system utilizes an idle speed control (ISC) to maintain a steady idle regardless of engine temperature. The R3 comes with a closed loop fuel injection system, with an oxygen sensor that monitors the amount of oxygen in the spent exhaust gases and adjusts the fuel -air mixture via the ECU and FI system. The engine is mated to a 6 speed transmission and Yamaha refers to the 6th gear as “overdrive” and I would imagine this is to reduce engine rpms at highway speeds for better ride quality. The bore and stroke on the R3 runs shorter at 68mm X and 44mm which means the wide piston travels shorter resulting in a higher revving engine. The engine is setup on a diamond-type, high tensile, semi-trellis steel frame. The engine is a stressed member of the chassis, allowing a lighter, more compact main frame design. The riding position is one of the most important features on the R3. Although the R3 comes across as a super sport, it offers a balance between sporty handling for those track days and city based rider comfort as a result of which its not a track committed riding position, unlike the KTM RC bikes. The front to rear weight distribution is almost 50 /50. The rear is tapered, has a long design and is a high tensile steel swingarm. The meter console was right off the R6 with a large rpm analog style display and speed, temp gauge, odo and trip meter, gear and fuel indicator in a LCD display. The R3 allows an individual to set the gear indicator light to be adjusted per the riders needs so it does not go off at random rpms. Switches etc. are standard and nothing much to write about. Suspension on the front comes in the form of 41mm KYB conventional (no USD) style forks that offer 130mm (5.1") of wheel travel. We noticed that the rear comes with an adjustable monocross link-less rear suspension with a single KYB rear shock adjustable for 7-positions of spring pre-load. This adjustment allows the rider to tailor pre-load settings to match rider weight or load. We will still need to test out in real world conditions once the bike is made available to us for review. NON ABS brakes come in the form of a 298 mm floating front disc and is squeezed by a twin piston caliper which provides adequate stopping power in normal city riding conditions but lacked bite on the track. The rear is a 220 mm disc and is squeezed by a lightweight single piston slide-type caliper. Yamaha did however mention that ABS is being looked into on future models of the R3 and will be made available in India. Aiding the stopping are the soft compound tyres that MRF have provided with a 110 on the front and a 140 at the rear. As replacements I believe they will cost ~4500 to 5000 a pair should you choose to use this as a track only bike. That’s good news for a lot of track focussed audience folks out there. The R3 comes with Clip-on style handlebars that provided super sport image but at the same time offers a comfortable, more upright riding position given that they are mounted above the top triple clamp. The 14 litre fuel tank looked wide from the side but is actually quite narrow and it provided adequate level of knee grip while on the track. Now let’s look at what the competition offers. Some of the motorcycles that the Yamaha R3 will be compared against in India are; the CBR 250R, Kawasaki Ninja 300 and the KTM RC 390. I am not going to go into too much of a comparison as I will leave that for a full blown back to back review of the R3 against the others when we get a hold of them. While we wait for the CBR 300R, I know the 250R is a great handler and while its low on performance it’s a great beginner sports bike that offers excellent ridability on and off the track. If you’re looking for downright initial performance and pure track focussed design, look no further than the KTM RC 390. This bike does go ballistic from idle, but city riding aside ask yourself do you really want a bike that’s edgy while cornering. The only direct competition that the R3 has comes in the form of the reigning champion for a number of years, the only other twin, a Kawasaki Ninja 300. Compared to the R3 No ABS but comes with a slipper clutch, petal rotors and a high revving engine that kicks in after 7000 rpm all the way redlining at 13000 rpm! While there will be many that will try their best to find fault across the four bikes mentioned above and will end up comparing several factors, I think at the end of the day you need to answer a really important question, how much do you really want to spend, you primarily ride in the city (daily), weekend rides where you need something fun to play with and would you be willing to shell out Rs. 3 Lakhs plus for a beginner sports bike. In my opinion the Yamaha R3 has quite a lot going on for itself and strikes a good balance between a city ride and the occasional track day bike. I think the R3 and the Kawasaki Ninja both come across as good bikes and are well suited for the daily run and occasional track days. As a track enthusiast you may also want to consider the aftermarket parts available for the R3. Again, I will reserve my comments for later when I have ridden the bike extensively. Don’t look at the R3 being featureless as a result of cost cutting but rather look at the features that work well and being made available to you at a good price. The bike looks really cool, fit and finish is good and you’re backed by Yamaha’s excellent service in India. The Yamaha R3 will initially be available in two colours, full black and a Blue/silver combo. The 1st set of bikes will be dispatched on 20th August and will be made available for delivery between last week August and 1st week of September. Thanking Yamaha for this opportunity we leave you with some pics from the launch. Media equipment courtesy of Sony India for providing the camera and the lenses. There are positives to this launch. As well as some negatives. One major negative was even admitted by Yamaha during the launch.